Practice your swing or just have fun with your family, friends, or kids when you rent our popular golf game! 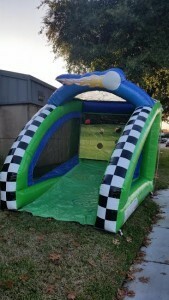 Challenge your event participants to take a swing to see who can get a hole in one with JumpHouse.com’s Golf game. Do your best to drive the ball up the green, keeping it between the sides of the game. There are four different size holes in the back of the unit making it hard to get the ball through.